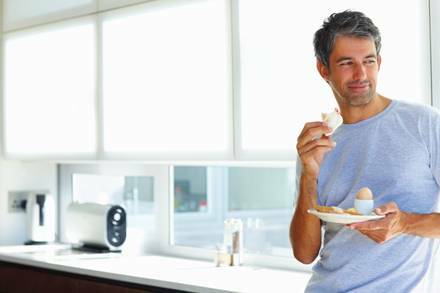 Men’s nutrition needs to be spruced up in order to live a more fruitful life. Essential nutrients in the right proportion ensure good physical, emotional and mental health. These are essential for a happy, healthy life. In this article, we have listed 5 most important nutrients for mens health. Besides helping the digestive system to function properly, fiber is known for its ability to maintain weight and reduce probability of having diabetes and heart disease. According to the Institute of Medicine, men eat just 15 gm of fiber every day whereas RDA (recommended dietary allowance) of fiber for 19-50 year old men is 38 gm and above this age is 30 gm. Nuts, beans, salads and colorful fruits and veggies. This mineral is required by the body for muscle contraction, cardiac movements and keeping a check on blood pressure. It makes bones strong and reduces risk of blood pressure, stroke, osteoporosis and kidney stones. Therefore, RDA for men aged between 19 and 50 is about 4700 mg of potassium every day. All types of fruits and vegetables, but avocados and white beans are the best. Avocados contain 487 mg of the mineral and a cup of white beans have 1200 mg of the same. It keeps vision and immune system working at their optimum. Mens nutrition must be supplemented with 900 mg RAE (retinal activity equivalents) for men above 19 -50 years to lead a wholesome life. Orange, red and yellow colored veggies like carrots and peppers. Just one cup of musk melon provides the recommended daily requirement. It is one of the most important in men’s nutrition needs. Vitamin D is needed to use calcium and phosphorus for stronger teeth and bones. Deficiency of vitamin D can lead to fragile bones in adults. Therefore it is recommended that adult men of 19-50 years should take at least 600 IU of Vitamin D every day. Mushroom, eggs, salmon and cabbage. This nutrient has a role in almost every function of the body. Men’s body needs more protein than a woman’s body. Athletes need even more. Therefore, one -third of your plate should comprise of only protein but do not exceed this limit. Also eating just a few grams of protein can result in muscle loss, skin pigmentation, fatigue and irritability. A cup of milk, a bowl of yogurt, a cup of dry beans and meat (minimum 3 ounce) daily. A diet comprising of the above 5 nutrients in mens nutrition will keep him healthy for a long time.